Most homeowners will state they need a ramp, about 10 feet long. However, when we go to measure the 10ft ramp they thought they needed, creates a wonderful sliding board. ADA and the 2015 International Building Code state that for every 1 inch of rise there must be 1 foot of ramp. 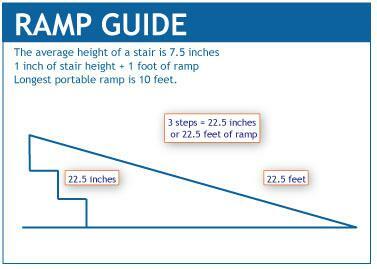 For example, if there are 2 steps into your home and each step has a height of 7 1/2 inches you will need 15 feet of ramp. A common mistake is purchasing a small portable ramp thinking that one can push or pull a person in a wheelchair up a ramp covering 3 steps. This is virtually impossible and extremely dangerous for the person in the chair and the person trying to move it. Different communities have different regulations regarding ramp compliance and required property line set backs. It is important to know what your local building codes are before purchasing a ramp. They are available at your local municipality government office. You can contact Avenue Medical Construction for expert guidance. Portable ramps are lightweight, made of aluminum or fiberglass and many fold for ease of transport. They can be used to access homes, other buildings or to maneuver over curbs. They can also be used to easily load and unload manual and electric heelchairs and scooters to and from vehicles. Portable ramps are available in lengths from 2 feet to 12 feet and in weight capacities up to 800 pounds for a variety of uses. This type of ramp is a secure solution for temporary or “semi permanent” home access. Ramps are available in 2, 3, 4, 5, 6, 7 and 8 feet lengths to cover 2 – 8 inches of rise. No folding or assembly is required. The single fold portable ramp is available in 2 feet – 8 feet lengths so it can cover rises of 2 inches – 8 inches. It folds in half lengthwise and can easily be carried. This aluminum ramp weighs from 9 – 42 pounds and has an 800 pound weight capacity. Another style of single fold portable ramp can be separated lengthwise into 2 sections that weight only 6 – 15 pounds each. Each section has its own ergonomically designed handle making it even easier to use, carry and store. This style of ramp is available in 2, 3, 4, 5, and 6 feet lengths. The tri-fold portable wheelchair ramp offers the length required for wheelchairs and scooters to easily access steps, vehicles and raised landings. This ramp can be carried as one unit or separated into 2 individual sections. Aluminum Threshold Ramps are lightweight yet durable ramps that are secured with fasteners to doorways. They are 34 inches wide and available to accommodate thresholds from 1 – 6 inches in height. Rubber Threshold Ramps require no installation, are simple to use and are easily moved to another location. They are made of 100% recycled materials and are ideal for indoor or outdoor use. Like aluminum threshold ramps, they are ideal for use with canes, walkers, rollators, scooters, power and manual wheelchairs. They have beveled sides with a useable width of 36 inches. For wider entrances, two ramps can be placed side-by-side and rubber ramps can easily be trimmed for a custom fit. Rubber Threshold Ramps can accommodate 1 1/2 – 4 3/4 inches height transitions. If a ramp does not provide the solution you’re looking for, consider a lift. Click here for more information about lifts.